Mike Hudson's team starts pulling apart an old barn on the shady side because the temperature is approaching 90 degrees in Malta Bend, Mo. The pieces of the barn will be sold as reclaimed barn wood. 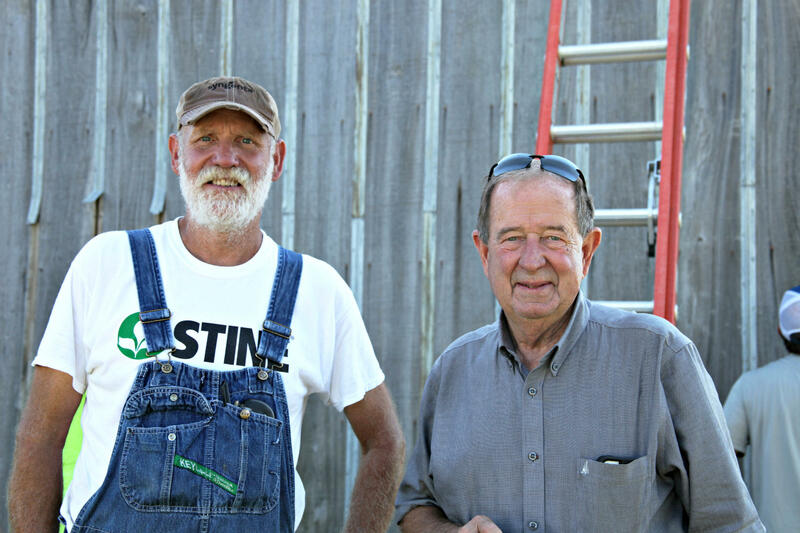 Farm owner Larry Gerdes and tenant Ben Kirrchoff inherited a barn several decades ago that is no longer sturdy enough or large enough for modern farming. 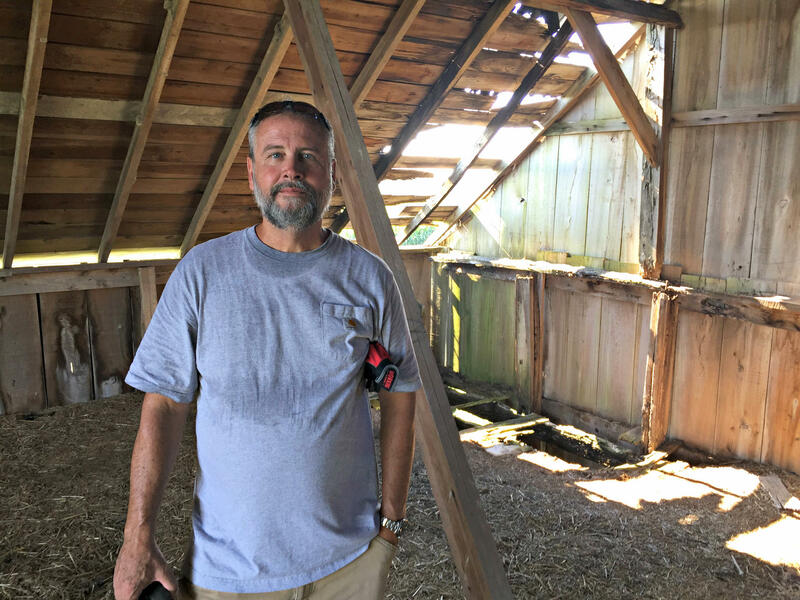 Mike Hudson, standing in the hayloft of his current barn project, says he will deconstruct about 10 to 12 barns in the next year. He sells the reclaimed wood at his lumberyard in Elbert, Colo.
Larry Gerdes is having his barn taken down and disassembled in Malta Bend, Mo. It's about the size of a three-car garage but stands much taller in a clearing surrounded by 6-foot stalks of corn. The barn's exterior is graying, part of its roof is missing, and there's a gaping hole looking out from the hayloft. It's about 100 years old, and it's not really useful. "It's deteriorated and it would cost a lot of money to repair it," Gerdes says. "And it doesn't fit into modern farming. Unless you got two cows to let them loaf inside, nothing fits, and it's just obsolete." While a quaint wooden barn lost in a field of greening corn is a classic farm country tableau, for modern farmers, many of these aging barns have lost their purpose. The barns can't fit today's giant tractors and are too small to house the larger herds of cattle or hogs. While the dilapidated barn might be a nuisance for farmers, reclaimed barn wood is a hot decorating trend from Manhattan to Manhattan Beach. Turn on HGTV, and you'll see people asking for reclaimed barn wood on many of their shows, including Fixer Upper. Using barn wood is so popular right now, it even has its own slot on the DIY Network — a show hosted by Mark Bowe called "Barnwood Builders." Old barn wood is called a lot of things in the construction business, like reclaimed, salvaged or repurposed. For 20 years, Bowe has been taking old barns apart. He says his customers are interested in what's called "upcycling" — taking undesirable or waste materials and creatively reusing them. The barn siding he sells can turn into brewery bars or restaurant tables. "Most people want those accent pieces," he says. "They want to have those pretty beams in the ceiling or they want to have the barn wood walls, or the tables and the furniture." A few years ago, many farmers didn't understand how valuable their old barns were and might have been swindled, Bowe says, but today they know the capital they're sitting on. He says we're in the midst of a barn wood frenzy right now, but it still likely has a shelf life. Indeed, there are only so many weathered barns in the U.S.
"This is a finite resource," he says, "so it seems like every building we take down, we deplete our livelihood." With every barn that comes down, the classic landscape of American farmland littered with wooden barns fades away. The National Barn Alliance is trying to make sure that doesn't happen by preserving the buildings it can and documenting those that will come down. "Preservation in the past has really sought to preserve the great, grand mansions of important white men, but we're so far beyond that now as a discipline," says Danae Peckler, an architectural historian with the alliance. "We start to look at average landscapes that really tell the American story. And the farm is one of those." Peckler says she understands the big changes happening in agriculture, and accompanying modern barns, but she hopes people at least take photos and write down the barn's history before salvaging it for parts and selling them. "It makes me a little sad, but it also makes me a little excited," Peckler says. "It makes me think that we're realizing this has a cultural resonance with us." The barns have sentimental value to many people. Mark Bowe knows this. "We are changing the landscape for our future generations by removing these barns, and it is a bittersweet living for me," he says. "When we salvage barns for parts, we always take down the ones we know won't be standing in 15 years." Mike Hudson hasn't been in the business as long as Bowe, but says he feels the same way. "Sometimes it's not real exciting taking it down, because you understand the history behind the barn," Hudson says. Hudson's business also deconstructs old barns, de-nails the pieces and then sells them to contractors or designers. They'll use it for flooring, furniture and accent walls. And while he has acquired some barns for free, he has also paid up to $1,000 for one. "There's a lot of expense involved that people don't quite understand," he says. "Even if you got a free barn, it's not necessarily free. We spend an average of about $500 a day in bringing one of these down respectfully." 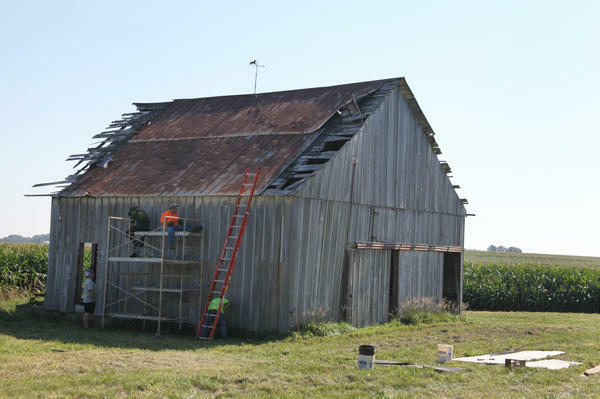 Hudson and his team were hired by Larry Gerdes in central Missouri to pull apart the barn by hand, using hammers and crowbars. It will take about two weeks to take Gerdes' barn down, Hudson says. In the end, he'll sell the wood for between $5 and $10 a square foot, depending on species, size and condition. Black walnut, red oak and chestnut are some of the more expensive species, he says. "This is it. This is what I have a passion for," he says. "And if you can find that passion, that's what you stick with. It's not always about the money." Hudson says he has an immense respect for the crafting and history of old barns. He takes photos to share with the owners and always asks about the history of the farm. "That's the thing we take into consideration when we come in, because we're just as passionate about bringing it down properly [and] respectfully as the pioneers were back then to build it," he says. So what happens when the barn wood trend fizzles out? Mark Bowe says look for people trying to repurpose material from a different era. "Maybe we start to see more factory beams incorporated," he says. "The story becomes less about the early pioneer and more about the industrial age, with large factory timbers and factory floors." This story comes to us from Harvest Public Media, a reporting collaboration focused on food and agriculture. Copyright 2016 KBIA-FM. To see more, visit KBIA-FM. SIEGEL: Professor Kenneth Rogoff's new book is called "The Curse Of Cash." Transcript provided by NPR, Copyright NPR. 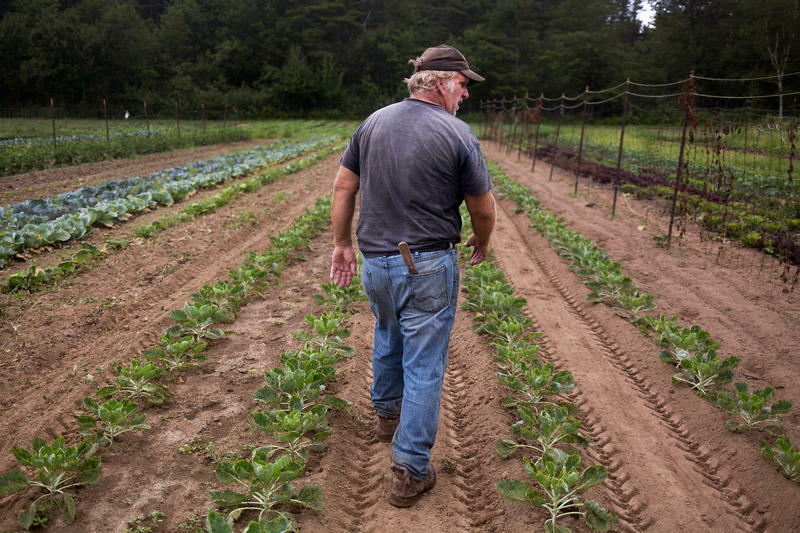 As the farming population gets older, a federal grant is going to fund training programs for new farmers.